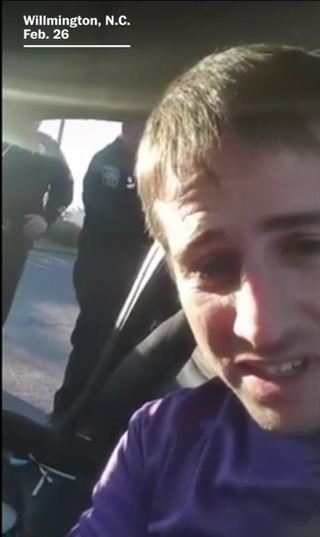 A criminal-defense attorney in Wilmington, N.C., was pulled over by police recently, and as he began to film his interaction with them on his cellphone, one of the officers falsely told him that there was a new state law that prohibited him from recording the police. Jesse Bright knew there was no such law in North Carolina. He told the Washington Post that as a lawyer, he believes strongly that when people record their interactions with police, it helps reduce confusion if their cases end up in court. Bright, who was driving for Uber at the time to make some extra cash, said he was surprised when Wilmington Police Sgt. Kenneth Becker told him it was against the law for him to record. “Hey, bud, turn that off, OK?” Becker said. A tense exchange followed, with Becker telling Bright to step out of his car, calling him “a jerk,” then warning him that he “better hope” officers didn’t find something in his vehicle. “And an Uber driver?” Becker asked. The Post reports that Bright said he was working for Uber to pay off his law school loans. At the time, he was driving a passenger on a round trip from the man’s home to pick up a paycheck. He was pulled over several moments after the man returned to his car holding a piece of paper. Officers told Bright that he had taken the man to a drug house that was under surveillance, and they searched Bright’s passenger. The Wilmington Police Department has launched an internal investigation regarding a recent video-tape of a February 26, 2017, interaction between one of our Police Sergeants and an Uber Driver. While we are not at liberty to discuss the investigation, we do believe it is crucial that we address a question that has surfaced as a result of that video-tape. A copy of this statement will be disseminated to every officer within the Wilmington Police Department. Bright told the Post that the officers searched him and his car but did not find anything, so both he and his passenger were told they were free to go, and neither man was charged with a crime. Bright said that he never had any doubt that Becker was lying to him about the do-not-film law. Bright also said that Becker’s commands to stop recording, as well as searches to which he did not consent, violated his constitutional rights, and he noted that it is in an officer’s best interest to suppress video because it allows police to dictate the narrative later if a case arises. During his interactions with Becker, Bright also asked a New Hanover County sheriff’s deputy at the scene to tell him whether a new law had, in fact, been passed that would prohibit him from recording police. “I’ve never heard of this law that you’re not allowed to record the police anymore—it must be brand-new,” Bright said. “Well, they just recently passed it,” the deputy responded. New Hanover County Sheriff Ed McMahon told ABC affiliate WWAY that after reviewing the video, it was clear that his deputy was incorrect, and has been counseled. Bright said he went public with his video after Becker refused to return his phone calls and the department never apologized. Although he does not want the officers involved to be punished, he hopes to let the public know that they have a right to film the police.